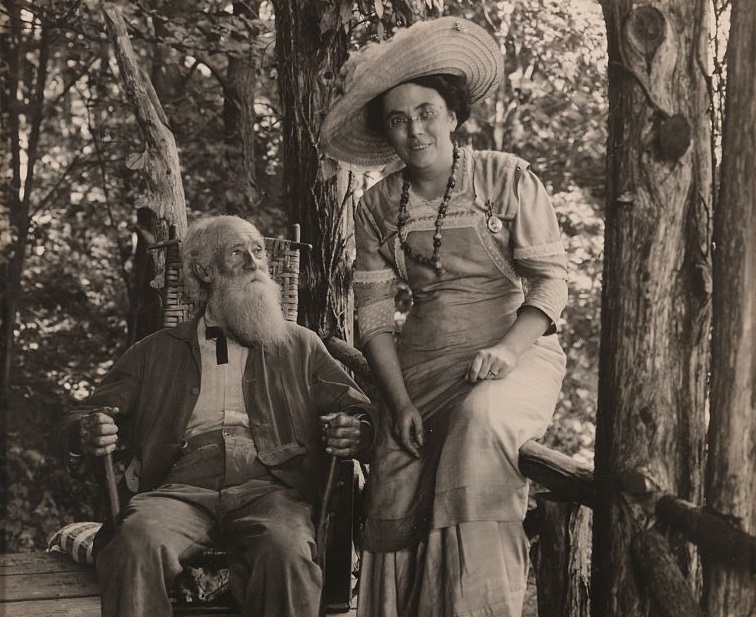 John Burroughs with photojournalist Jessie Tarbox Beals, who took this photograph on the porch of Slabsides, Burroughs’ summer cabin in West Park, New York, around 1908. Courtesy of the Library of Congress. A Day with John Burroughs, a mesmerizing nine-minute film shot in 1919 using a new motion-picture technique called Prizma Color, contains footage of the great naturalist at Woodchuck Lodge, the farm Henry Ford bought for him in 1913. Eighty-two years old—he would die two years later—Burroughs was at “the summit of my years,” to quote one of the film’s title cards. He leads three children through the area surrounding his cabin and shows them how to uncover the joys of nature: living creatures under a rock, the camouflage of a frog, the evidence of glacial striation, and the habits of nature’s “clown” (a grasshopper). But he inveighed against those amateur naturalists who took things too far by adding anthropomorphic elements to their nature writing. In a 1903 Atlantic Monthly essay, Burroughs denounced a number of writers who infused their supposed observations of animal life with all-too-human intelligence, emotion, and sentimentality, and he singled out for scorn the popular author and minister William J. Long, who published a number of books specifically for schoolchildren. In Long’s texts, adult animals conduct classes for their broods and birds convert twigs into splints for their own injured legs. “What the ‘life secrets’ are that he claims to have discovered, any competent reader can see,” Burroughs exclaimed. “They are all the inventions of Mr. Long. Of the real secrets of wild life, I do not find a trace in his volume.” Burroughs’s attack launched a veritable war in print between scientists and sentimentalists. Notes: John Tyndall (p. 147) was a nineteenth-century British physicist known especially for his popular science writings. The lines of poetry on page 150 are from Wordsworth’s “A Poet’s Epitaph.” Catharine Aiken (p. 152) was a noted educator who published Methods of Mind Training (1895) and Exercises in Mind Training (1899). Alpheus Spring Packard (p. 154) published the reference work Guide to the Study of Insects in 1869. I do not purpose to attempt to tell my reader how to see things, but only to talk about the art of seeing things, as one might talk of any other art. One might discourse about the art of poetry, or of painting, or of oratory, without any hope of making one’s readers or hearers poets or painters or orators. . . . If you don't see the full story below, click here (PDF) or click here (Google Docs) to read it—free! The selection by Burroughs begins on the second page, after a short biographical essay. A little bit pecular--such as you can't see anything unless you have it in your heart. But basically this should be required reading for aspiring naturalists because too many that I know are still "nature fakers" because the general public is fascinated by their simplistic and anthropomorphic explanations. And I don't think they have gone beyond that themselves. Is n' t it something to have a keen sense of observation and curiosity to know about creatures around u? That was a good read I enjoyed it.